I am always on the lookout for places that offer “touchable history,” where interesting, unique lessons can teach me more about the place that I call home. This week, we get in touch with a real historic hotbed across a landscape that was once a zone of volcanic eruptions, magma flows and the birthplace of mountains. Oregon’s high desert is vast, timeless and remote — where distances are great and people are few and where the only outpost for miles. It’s unlike any state park you’ve ever seen. At Fort Rock State Natural Area, you won’t find many people, phones, radios or TVs, and many of the people who visit the distant site like it that way. “I saw it through the forest from a distance and thought, ‘Is that it? Is that it?” says Eugene resident David Foster. He traveled to Fort Rock, camera in hand, to explore a unique chapter in Oregon geologic history far away from the city’s hub-bub and noise. Foster is right! 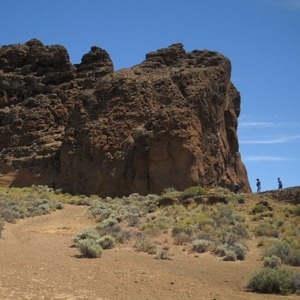 Fort Rock isn’t an old military outpost but an ancient volcanic eruption. Fort Rock was a small basaltic vent that formed a tuff ring when it first exploded to the surface — and under the water — 100,000 years ago. 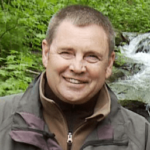 You see, the surrounding landscape was once an expansive inland freshwater sea — up to three hundred feet deep — that resulted from melting glaciers that reached into the area. Over thousands of years, wave action of the lake eroded the tuff ring’s southwest wall away and left terraces along the front and insides of Fort Rock. Most park visitors enjoy exploring the expansive caldera, searching for petroglyphs among the towering the rock walls. 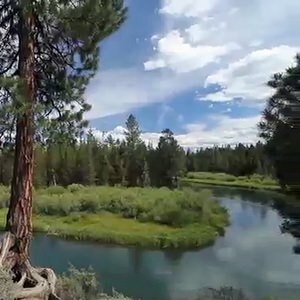 If you want to ramble for a longer stay, check in at LaPine State Park, 45 minutes away along State Highway 97. The huge parkland offers rustic cabins for rent, plus full hook ups for trailers or RVs. 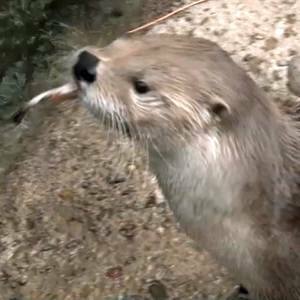 Twenty miles to the north, on the grounds of the High Desert Museum, stroll over to the newest addition to the museum’s grounds where you can meet two river otters, Brook and Rogue, at play. The new otter exhibit is a remodel of an exhibit that was built in the early 1980’s. The project took seven months to complete at a price of nearly $200,000. Wolf adds that it’s the perfect venue for youngsters who can lend a hand and learn more about wildlife too. The exhibit showcases recent discoveries of fossils that show a very different shark species, one that reached up to 40 feet in length, weighed several thousand pounds and had the most unusual jaw and teeth. Roughly 290 million years ago, a genus of a very distinctive shark-like fish, the Helicoprion, swam in the ancient sea that once covered much of the region. Alaskan artist Ray Troll refers to this creature as the “weirdest, coolest shark of all time,” and for good reason. The Helicoprion, whose name means “spiral saw,” owned what is arguably the most unusual set of teeth in the animal kingdom. What is the high desert connection? The museum spreads across 150 acres, filled with exhibits and demonstrations. A mile-long trail goes through 25 acres of trail-side exhibits, including a trout stream, otter ponds, porcupine dens and interpretive displays of frontier life and industry. You’ll love seeing the many wildlife species on display at the museum too. Hawks, eagles and turkey vultures are frequently seen soaring over the wide expanse of the desert, but at the museum you can see them all close at hand and learn about their special adaptations for survival. Education and recreation — it’s all at the High Desert Museum and so easy to find on your next visit to Central Oregon’s hotbed of history.